Traveling with an toddler? Check out what we we suggest for packing your Carry On When Traveling with a Toddler. Then head over to read about what we pack in our luggage. Feel free to download our handy packing checklist here!!! It’s hard to predict what you will need, but having survived long haul flights of 10+ hours at both 3 months and 10 months, I have a few ideas of what might make that journey just a bit easier. 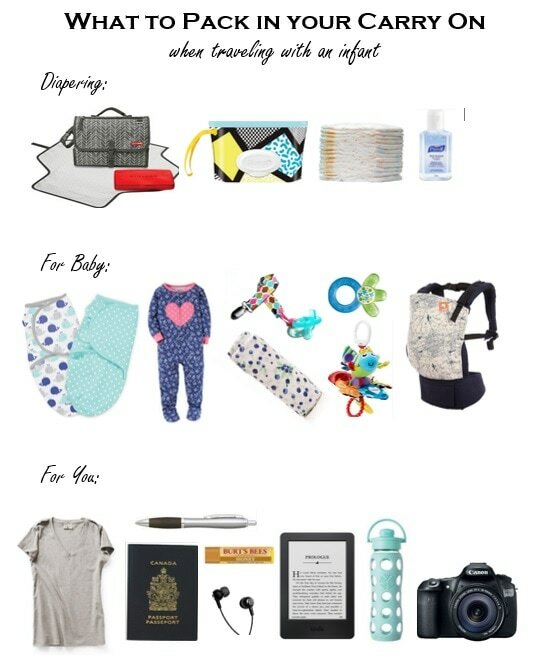 Below is what I think you should pack in your carry on for travel with an infant under about 6-9 months who isn't eating solid food on a regular/consistent basis. Check out my post on What to Pack in Your Carry On : Toddler if you're interested in the differences! The good news is that your infant likely still takes 3-4 naps a day, so no matter when the flight is, it’s likely they will sleep through part of it. My husband and I each pack a backpack as a carry on. His typically has our electronics, digital camera, our books and some snacks for the flight while mine typically has more of the baby related stuff. That being said, I've also done at least a half dozen flights alone with baby and so it is totally manageable to pack everything you need in one bag! Diapers and Wipes (lots of them! ): Take into account the time of day you’re arriving (stores might not be open late at night at your destination), layovers, potential delays and the chance that your baggage might not arrive with you. We were delayed a couple hours in the Athens airport and another 30 minutes once we had boarded our flight to Santorini and so I was thankful to have overpacked. We pack our diapers and wipes in the Skiphop Pronto change station. This has been one of my favorite baby items. It holds diapers and wipes, opens up into a place to lay baby to change her and has a front zippered pocket that I keep stocked with Ziploc bags (to hold dirty clothes in case of accidents). Change of Clothes: This goes for your baby AND for yourself. Structured Carrier: While the carrier can’t be used during take off and landing it can be used at any other time of flight either sitting (so your hands are free to read, or fall asleep yourself) or standing/walking. You will get tired of holding your baby in your arms no matter how small they are, or how short the flight is; the carrier is a must have. Swaddle We used swaddles at home for sleep and they were part of our sleep routine. When we took a 10 hour red-eye flight to Athens it was important to bring the items that created a familiar environment for sleep. Whatever it is that you use (pacifier, lovey, muslin blanket etc), bring it with you. Toy(s)​: We picked one toy that we knew our daughter liked. It was also a toy that had multiple elements (it vibrated, had a rattle inside, crinkled and had contrast elements that she liked to look at). Infants are not typically “playing” with lots of toys and so it is easy to get away with bringing very few with you. If your little one is teething, consider bringing a teething toy with you as well. Receiving Blanket: for spit ups, as a nursing cover, a blanket if it gets cool and to lay down on the seat underneath baby this is a must have multi-use item! Water Bottle: This is especially important if you are breastfeeding. I have read that for every hour of flight you should drink one cup of water and having your own bottle will be more convenient than having a flimsy cup sitting on an open tray table while simultaneously holding your little one. Mom Stuff: These are other miscellaneous items that I never fly without. They include my passport (of course! ), a pen to fill in customs declarations or any other paperwork, chapstick, hand sanitizer, earbuds to use the inflight entertainment, my digital camera and my e-book. Less is really more when you're packing your carry on! It can seem tempting to bring it ALL and the kitchen sink but it will only leave you frazzled and overwhelmed trying to keep track of your stuff and trying to find the things you actually need! Pack the essentials and leave the rest, you'll do great! !